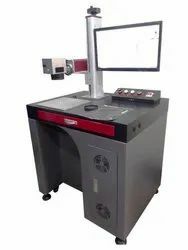 Prominent & Leading Manufacturer from Delhi, we offer fiber laser marking machine. 1. Widely used in electronic part and component, electrical engineering, electrical appliance, telecommunication product, car and motorcar spare part, instrument and meters, plastic case, aviation and aerospace, military product, hardwareitting and accessory, facility, measuring implement, cutting tool, sanitary appliance, stationery, medicament, food and beverage, make-up, medicine packaging, medical instrument, clock and jewelry, light-through key board, solar PV, and craft, etc. 2. Widely suitable for various metals, alloy, metallic oxide materials and some non-metallic materials(silicon wafer, ceramics, plastic, rubber, epoxy resin, ABS, printing ink, plating, spraying, and coating film, etc. 1.Fiber laser: high- speed scanning galvo mirror; English operation system. 2.Strong software functions, convenient Control Panel, set and deal separately. 3.Professional control software is compatible with AutoCAD, CorelDraw and Photoshop, etc. 4.It could achieve the auto arrangement and amendment of letter, symbol, pattern, figure, image, bar code, 2D code, serial number, and auto increasing, etc. using TIF, SHX character code. 1. One year warranty, any spare parts can be replaced free of charge, and on a cost price after warranty. 2. online service support free of charge during life-span. 4. online service each day, free technical support. 5. Machine has been adjusted before delivery, operation disk is included.